If you aren’t completely caught up on AMC’s The Walking Dead, then please stop reading this post as there will be MAJOR SPOILERS about last night’s episode. Further, If you're not at least 60 issues into the comic book series, please stop reading, as I'm going to talk about storylines in the books, as well. Okay. Now that that's out of the way, let's talk Walking Dead. There's been plenty of criticism from comics fans (online, mostly) about how the TV series has diverted from the comic book series in terms of story. Towards the end of last season and into this season especially, we've seen a pretty radical departure from the comic book storyline. And, I have to say, I'm cool with it. See, I like not knowing what’s going to happen next. Sure, major characters and major beats from the comic are there, and there have been moments when readers of Kirkman’s book have known exactly what to expect at certain points in the series. Still, that didn't do anything to lessen the tension or to take me out of the story. If anything, knowing something bad is going to happen is worse than not knowing it's coming. Hitchcock's "Bomb Theory" springs to mind here. But I think as long as there are roots in the comic book series—and there most definitely are in AMC’s adaptation—I’m good with whatever the TV writers have planned. The biggest diversion from the comics comes in the form of the incredibly entertaining character, Shane. In the book, Shane doesn’t make it past the first six issues. By the time the comic book group gets to the farm, Shane is long dead and long forgotten. But in the TV show, Shane is still around. And thank goodness for that, because he’s the most interesting character in the series. 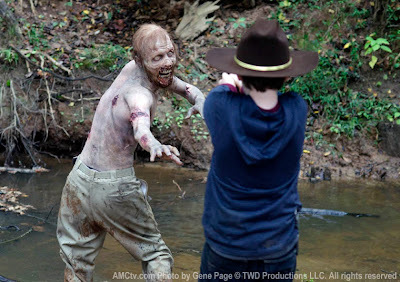 The tension that’s built up between him and Rick is priceless, as the two actors play off one another incredibly well. Dare I say it, but I actually prefer having Shane around. Now, knowing Shane’s comic book counterpart’s fate makes every seemingly innocuous moment between him and Carl much more suspenseful for Walking Dead readers. I get uncomfortable every time those two are on screen together. But that’s not a bad thing. This is a horror story we're talking about, after all. And it seems the series will divert even further from the book, especially after last night's episode and the shocking death in the final moments of the show. I say "shocking" because of where in the story it happened. For readers of the book, while the character's fate might have been the same, the "where" and the "when" took me completely by surprise. By shifting timing around, the writers managed to take an expected death and make it shocking. So much so, in fact, that I needed to recover from watching it before I went to sleep. Somehow, AMC is pulling off the perfect non-adaptation adaptation. By diverging from the comic at key points in the show, the writers and producers have created something that's both similar to Kirkman's monster hit book and completely different. Well done, I say. Well done.